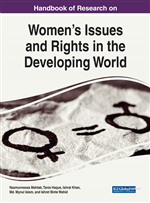 Does international migration have a role to reproduce unequal gender relation in a patriarchal society? How does it make such role? How does it further implicate people's religious as well as cultural practices? These are the questions have been addressed in this paper. It takes the case of Bangladesh, a South Asian Muslim-majority country with millions of international labour migrants to different Middle East and Gulf countries including Saudi Arabia, United Arab Emirates, and Bahrain. This international migration makes very positive financial contributions to the migrants and their families at origins, mostly in rural villages. The paper makes it focus on social outcomes, especially on household level gender relations with such migration. Taking up the idea of ‘social remittances', it argues that these migrants, mostly men, experience with a range of ‘Islamic' norms and practices in destinations, and send back those to origins for religious obligations. These norms and practices largely include discouraging female household members, especially wives, to earn or go outside without purdah in line with the perceived ‘Islam'. The paper explains that such ‘social remittances' encourage the female household members to be ‘good' Muslim women along with the reproduction of gender inequality between women and men. Bangladesh, one of the top five of migrants sending countries (United Nations, Department of Economic and Social Affairs, Population Division, 2016, p.16) and ranks tenth as recipients of remittance in this year (KNOMAD, 2016, p.29). It has shown remarkable growth as its current GDP growth rate is 7.11 percent (“GDP - Bangladesh Bureau of Statistics-Government of the People's Republic of Bangladesh”, 2016) which is twice than the global GDP growth rate of 3.1 percent (International Monetary Fund, 2016, p.6). Such migration from Bangladesh constitutes the labour force in the destination countries, the very reason they are called “labour migrant” (Siddiqui, 2003). There are seven million Bangladeshi labour migrants working in more than twenty countries of which Oman is the highest recipient in the year of 2016 (“Overseas Employment in 2016”, 2016). As mentioned earlier, women accounts for 48 percent of the global migrants (Ratha, Plaza, & Ozden, 2016, p.3) whereas in Bangladesh their share in the migrant population is about 13 percent (United Nations, Department of Economic and Social Affairs, Population Division, 2016, p.29). In the current year, the amount of remittance has been about 11million USD (“Overseas Employment & Remittance from 1976 - 2016”, 2016). Remittance consists more than 7 percent of the country’s GDP (“Personal remittances, received (% of GDP) | Data”, 2016) and stands higher compared to the aggregate contribution of agricultural, industrial and service sector which is about 6.5 percent (Bangladesh Bank, p.4). Remittance has a significant role in country’s poverty reduction and building human capital (Hatemi-J & Uddin, 2013). A recent study by Bureau of Manpower Employment and Training (BMET) suggests that remittance has significantly contributed poverty reduction in Bangladesh and poverty ratio fell to 50 percent in 2000 from 70 percent in 1970 (Bureau of Manpower Employment and Training, 2016). The recent transition of Bangladesh in the list of middle-income countries (“World Bank Country and Lending Groups – World Bank Data Help Desk”, 2016) clearly directs us towards the fact that the country’s economy is on the upward move.